Charles Bird King (1785-1862). Sequoyah. Hand-colored lithograph, Plate 13. McKenney, Thomas L. & Hall, James. History of the Indian Tribes of North America. Philadelphia: F.W. Greenough, 1838-1844. Sequoyah (Sikwayi), ca. 1760-1843 (Cherokee (Aniyunwiya)), also known as George Guess, was born in Tennessee, the son of Nathaniel Gist and a mixed-blood Cherokee woman. When his career as a successful hunter was terminated by a leg injury, he taught himself to become a master silversmith. 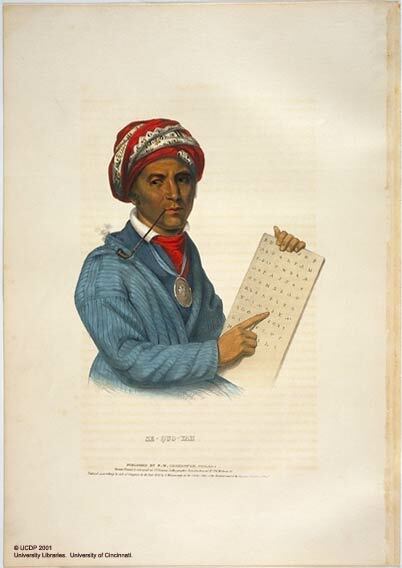 His natural curiosity, intellectual and mechanical skills led him to explore a variety of fields, but he is best remembered for his development of the Cherokee Alphabet. In 1823 he settled in Arkansas with the Western Cherokee and became a political leader of his people. He visited Washington, D.C. in 1828 where King painted his portrait. He died in Mexico while searching for a branch of the Western Cherokee. His name was given to some of the oldest and largest trees in the world - the Sequoia.